What a wonderful couple of days it has been. The Embassy Suites was a buzz with lots of needlepoint. The atrium style of the hotel made it fun to look up and see the designers’ banners hanging over the rails. What a nice sight that is. Each designer sets up a wonderful little shop in their room for us to indulge ourselves. What’s it like, think of a mall with nothing but designer needlepoint stores. It’s heavenly! The designers’ rooms allow you to feel like you are shopping in your favorite boutique. What did I see you all have been asking? Lots and lots and lots of great needlepoint from all the designers. Too many to feature it all here, so I have chosen some of my favorites to share here. Amanda Lawford has pretty new jewelry boxes available! They come in hot pink, torquoise, lime green, red, black, black with a zebra frame as well as black with a cheetah frame. And of course, a new box, means a new canvas size. Some familiar designs as well as some new ones. Also new from Amanda are small bird ornaments with crystal embellishments. A blue jay, cardinal, chickadee and white dove are available. The blue jay came home to nest with me. The boxes and canvases are on her website, http://www.amandalawford.com. Julia’s Needleworks has new lamps with an area for needlepoint. Wonderfully creative way to find a new place for needlepoint. Some of the canvases available also have matching bookends, think kid room. The lamps are available in black, white and a stained brown. I love these and see an endless potential for canvases. I am seeing a lamp or 2 in my future. I did get the cute frog canvas, he is a happy piece that will find a perfect spot in my breakfast room. Kelly Clark had a piece that just took your breath away! It was her doodle canvas, and if you have been following her blog, you have seen some peeks at her progress. Seeing it in person was truly spectacular. Her stumpwork and needleweaving techniques are just too cool for words. Kelly also had the next quilt piece available – a Christmas quilt. Kelly has put some of her stumpwork and needleweaving directions into a booklet along with a specially designed canvas to work these techniques. Needless to say, that found it’s way into my bag. Can’t wait to start playing with that! Raymond Crawford has new holiday stars available! Perfect as ornaments or a 3D tree topper for a small Christmas tree. Seeing the Gingerbread Holiday Train all stitched in person was a thrill. It’s a wonderful set that is stitched beautifully. He also has three new small holiday candles that would be great as small weighted standups. It’s always a treat to see Raymond, he makes me smile and laugh. His new designs are on his website,www.raymondcrawford.com. Strictly Christmas had great new canvases. You can’t help but love all the holidays when you walk into Karen’s room. New Squatty Santas for football fans with unpainted coats waiting for team colors to be added. A peppermint trimmed Squatty Santa for the candy lovers in your life. New Squatty Santa pillows also caught my eye. Stockings with jacquard borders, both new and old designs. A new angel stocking cuff made its debut. Karen always has a festive room, it is so hard to drag us out of there. The market was a great couple of days that I always look forward to. It’s a time to catch up with friends and make some new ones. Seeing Jo Ippolito Christensen and Suzy Murphy milling around is always a treat. It’s nice to rub elbows with the rock stars occasionally. Lovely ladies, I feel honored to be able to spend a few minutes with. A wonderful weekend comes to an end. I know this isn’t a comprehensive list of all the goodies at market, but it’s a few of my favorite things. We are blessed to be part of such a talented and creative industry. 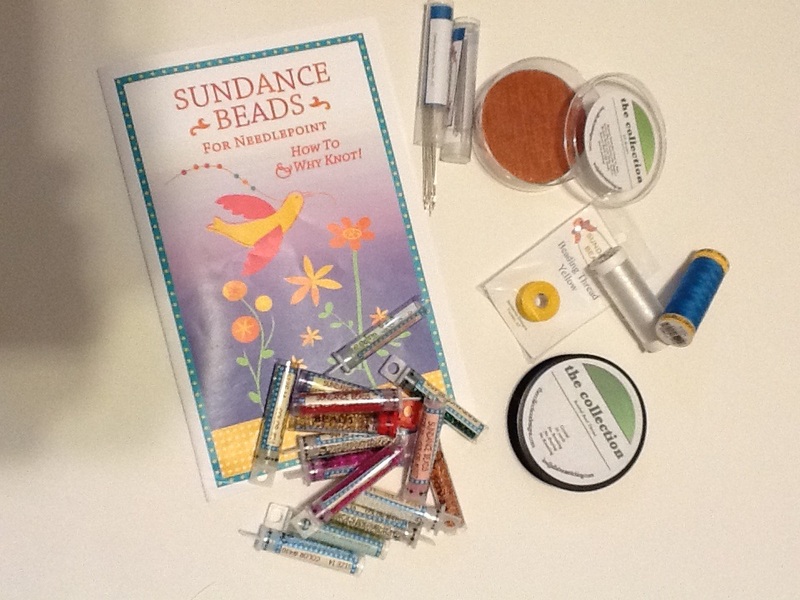 I can’t wait to start stitching……. As we approach the dog days of August, I thought I would share some of my summer adventures. 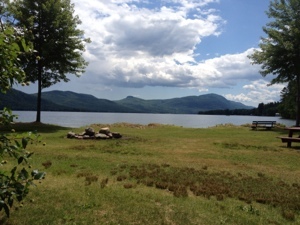 My family cottage on Lake George in the Adirondack mountains of New York allows me the opportunity to completely disconnect from the outside world for a few weeks,. It is a treasured time for myself and my girls, a step back in time so to speak in this digital age. We have no cell service, no television and no wi-fi. It is a true vacation to relax the mind, body and soul. (Wifi and cell service is a 15 minute drive, which I made a few times to check email.) I treasure the peace being disconnected allows me to have. Even my teenage daughter looks forward to not having a cell phone – which is miraculous, no texts, no facebook for a few weeks. She sends out the “don’t text me, I won’t have service,” message out about an hour before we lose service. We arrive and an immediate sense of calm comes over us and we feel like we are in another world. The sounds of the lake and the mountains haven’t changed in the all the years I have been going there. It is amazing how loud some animals sound as they creep through the dead leaves on the mountainside. 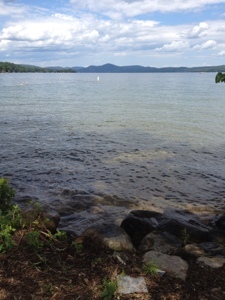 The lapping of the water against the rocks at the water’s edge offers a tranquil sound to enjoy each day. My girls enjoy a freedom they have nowhere else in the world. The community we live in is small, so the girls can walk everywhere they need to go. I see them in the morning for breakfast before they head off to morning camp. Even my 15 year old still loves going to camp to see all her summer friends, for it is there where the plans for the day take shape. We have lunch together at the beach and then they spend the afternoons playing in the lake, kayaking, tubing or sailing. They enjoy just being able to go do whatever they want with their friends. My 11 year old said she just likes to be able to walk around by herself with her friends and if they decide to go kayaking, they can. I spend the afternoons sitting by the water’s edge with my pencils and paper sketching out new designs. The creativity just flows when I can listen to the water splashing against the rocks. Maybe I need to add one of those desktop water gardens to my studio space. I was able to design several new geometric patterns that will become belts, purse straps, flip flops and even a new style of needlepoint shoes (still in development). The evenings are quiet and cool. The cool mountain air makes fleece a friend on most nights. The mountains are dark and the stars are amazing. Lake George is the only place I have ever been lucky enough to see the Northern Lights. I have never seen more stars then I see at the lake. It is fun to search for all the constellations with my girls. Later in the evening is when the excitement starts. We sleep on a screened sleeping porch. We all eagerly await the nightly visits from our friends, the raccoons! We have tried everything to keep them from our trash cans. It is like an olympic sport for them. One year, we used bungee cords to tightly secure the lids to the trash cans. We thought we were so smart. Not. The raccoons just rolled the cans to each other and into the trees until the cords broke. We brought the cans onto our small screened porch off the kitchen that is our cooler storage area and laundry area. That just brought the raccoon up close and personal. They used their claws like an Exact-O knife and slit the screens and hopped right on in, thankfully we have a locking door with windows to safely watch them. They are meticulous creatures. We have realized that our grandmother was quite wise. She used to make a “trash plate,” from leftovers each night and stuck it out back each night before bed. The raccoons come, eat and move on, leaving our trash alone. The kids love watching them from the bedroom windows and find their food choice fascinating. For instance, the raccoons seem to love pasta with red sauce, but are not fans of wilted spinach salad. Our days at the lake are treasured because they are a time to reconnect with family and friends. The escape from technology and being constantly connected allows us to enjoy the simple things. We are always sad to leave but spend the year enjoying the pictures we have and the memories we made. I have been a bad, but busy lady of late. Bad, because I have not been blogging. I tried to promise myself that I would blog every week….probably a bit ambitious for me at the beginning. Busy because I have been painting and finishing lots of things in time for graduations and the TNNA show in Columbus. Ok, only one piece for a designer in time for TNNA, but hey, I was honored to be asked! I have been busy painting some fun new geometric designs, originally painted for belts for a customer and then my mind got the best of me and now the ideas for the patterns and uses are flowing. 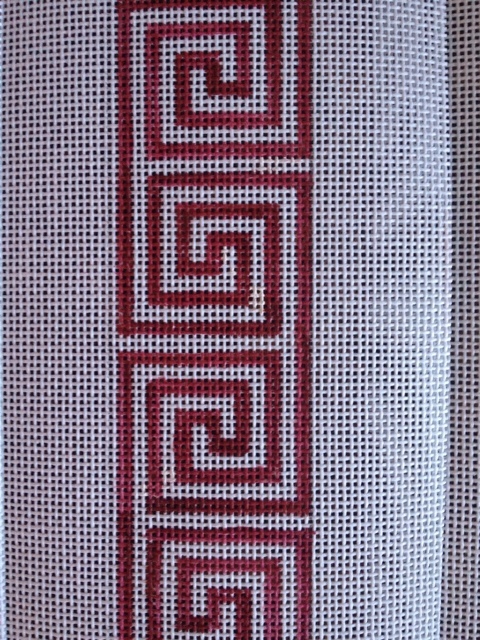 The red Greek key pattern will be stitched by my customer in navy and a wine color with a circular monogram for her daughter for Christmas. 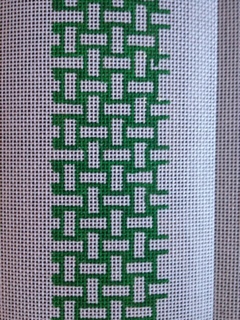 The green lattice pattern is for a navy and green belt with a red circular monogram for her other daughter. Once I was done painting these belts, my mind started wandering since I liked the designs so much. They are simple classic designs that work in many color combinations – pink/green, orange and hot pink, turquoise and a reef green, black and well, anything. The list is endless. As much as I would like a belt in every color ( working on painting myself a green and white lattice to work on when I go on vacation), I thought the lattice would be great with a circular monogram to fit inside my Lee nylon overnight bag. Another great idea was the Lee compact mirror or luggage tag. I like these because they are quick and easy projects for gifts that are nice to have for the car or plane. I usually have a belt that lives in my car so when I am caught in carpool line or have arrived too early for pickup after practice, I have something to do. As many of you can probably guess, I don’t do well with idle time. 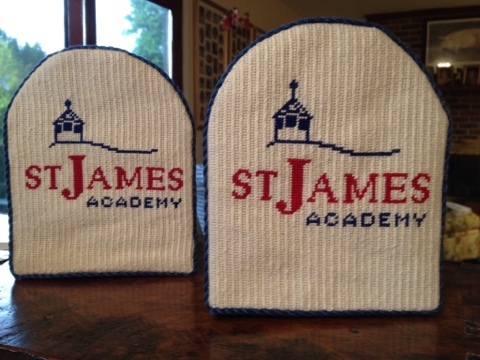 I have been painting college logos for the luggage tags, which then grew into the canvases for the compact mirrors from Lee. These make wonderful little gifts that are affordable and personal. I painted and finished a set of bookends for another customer’s grandson who was finishing 8th grade and moving on to high school. She was quite clever with her idea, instead of making 3D weighted stand up bookends, she handed me the inexpensive black metal bookends from staples and asked if I could do something with these. Sure can! She was thrilled and it didn’t cost an arm and a leg. This blog has been on my to do list for weeks, but every time I think I am catching up, I add a few more projects to the list. I am so very happy that everyone has such nice things to say about my work, it is very gratifying to me. I need to share what I am stitching on, but that is a long list too. But for now, let’s just say I have a few counted pieces, a belt, a couple of Kelly Clark’s trees, her crazy quilt and a few other things in various bags around my chair. I really need to learn how to sleep even less then I already do. Don’t you just love beads! I could spend hours in a bead shop, adding to my stash. So many colors, so many canvases, so little time. Where to begin….with the basics, I guess. Beads come in several sizes. 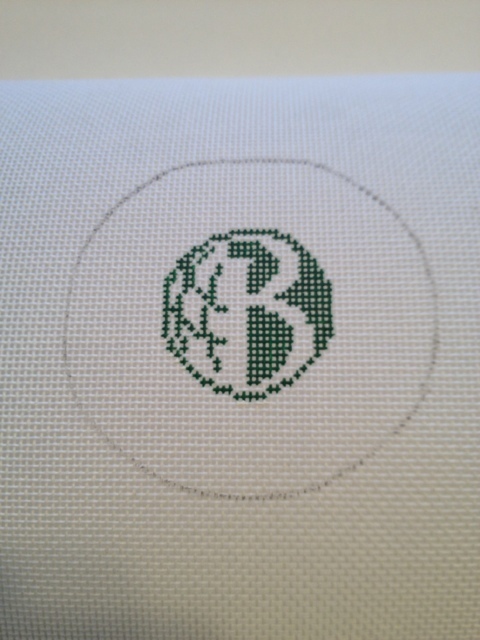 In needlepoint, a number 11 is the most commonly used seed bead. There are other specialty beads, such as bugle beads, which are long cylinder like beads. Larger completely round beads are also used by some needlepointers. All are great and serve their purposes nicely. A good needle is essential. I like the Sundance Beads beading needles. The hardest part of beading is threading the needle! Customers are always asking what kind of thread do you use for beading. Truthfully, I must admit, I use lots of different threads. I like The Collection’s Braided Bead Thread, available through your LNS. Sundance Beads makes wonderful beading thread in a large variety of colors to go along with their extensive line of beads. I also use invisible sewing thread from JoAnn’s, as well as embroidery floss. The thread you choose can have an effect on the color of your bead. For instance, if you are using a translucent bead and want the color to remain unchanged, use a thread that is clear in color. If you want to intensify the color of the translucent bead, match the thread to the bead color. If you want to alter the color of the bead slightly, play with the color of the thread. For example, if you are using a translucent yellow bead and you want it to appear slightly peachy, choose a peach toned thread. It will give you beads just a hint of color. This is fun just to play around with and see what happens, you might like what you try. How to keep beads from ending up all over the chair while you bead…..that’s a different story. I have used the tacky bob and the sticky side of tape. Another choice is from The Collection called the EZ Beader (the round wood item in the first picture). It is a nice piece of wood with a sticky top to hold your beads and magnets on the bottom to attach it to the canvas you are working on. I have a customer that took felt and glued it to the inside of jar lids, inventive, inexpensive and effective. Others prefer a small bowl with the beads in it. To each her own. Me, I love toys, so the EZ Beader is my best friend when it comes to holding beads. Now you are ready to start beading. I always knot the end of my doubled beading thread and bury it in some nearby stitching. I like to try different stitches when I bead, however, the basic way to bead is tent stitching. Nandra Hotchkiss and Cassandra Prescott of Sundance Beads wrote a wonderful little book called Sundance Beads, How To and Why Knot! It is available through your LNS. It is a book filled with helpful hints, bead descriptions and great stitches for beading. The above picture is from Sundance Beads How To and Why Knot! 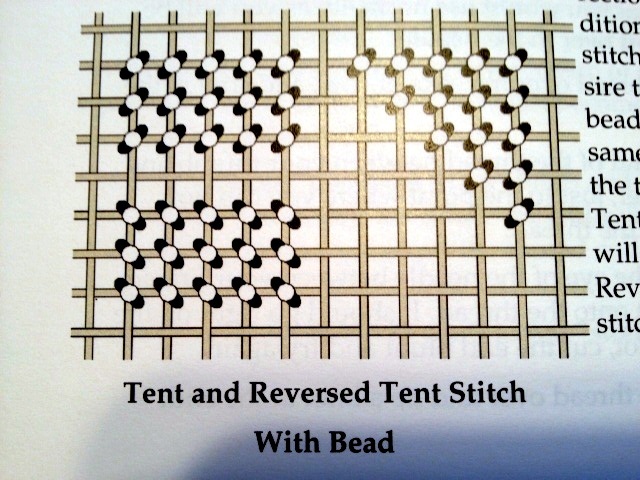 book and it illustrates how to bead using tent stitch. The beads will lay on the same slant as your stitch. To get your bead to lay vertically, I come up through the bottom right hole, add my bead and go down directly above the hole I came up in, crossing a horizontally thread. Then, I come up in the hole directly to the left of where I came up the first time, this time I go through the bead and then back down directly above that hole, again, crossing a horizontally line. 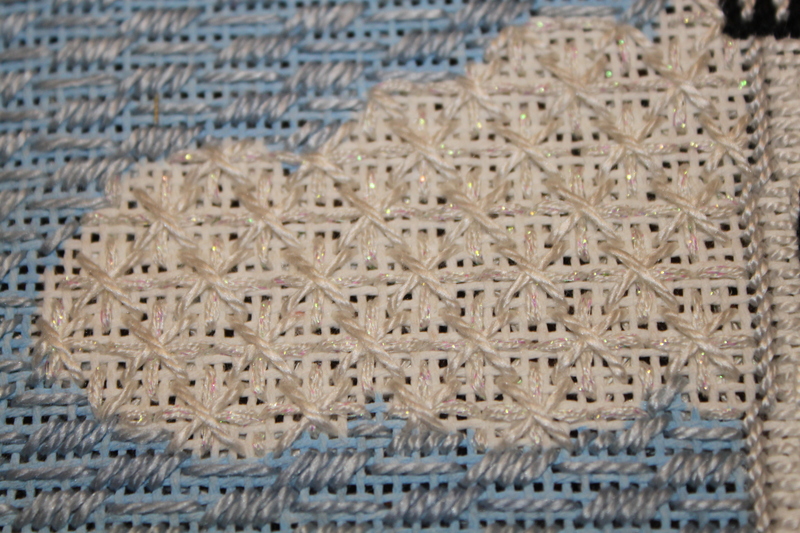 Another technique in beading is basketweave beading. This gives your beads a vertical direction on the threads that lay horizontally and a horizontal direction on the threads that lay vertically. It is a wonderfully cool look for objects like hearts, circles, packages and lots of other things. Don Lynch of Associated Talents uses this technique and has great directions on the Associated Talents website – http://www.atneedlepoint.com/guides/HE-801-GUIDE.pdf. You can see the technique on the hearts on the canvas and the directions are on page 2. One of my favorite ways to bead a large area, is to use skip tent stitch , filling in the empty holes created by the stitch with beads. It is easier than stitching every hole and the beads look lovely laying in nice, neat rows. 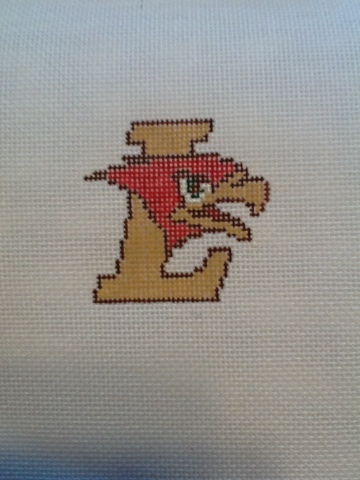 The other question I am frequently asked is how secure are beads on needlepoint. If beads are secured properly, they will be fine. I have several of my great-grandmother’s beaded evening bags. She didn’t just look at them, she used them. Now, I don’t really use them, I mean wouldn’t I look ridiculous showing up on the lacrosse field or at a field hockey game with a beaded evening bag. But, one day, I will use them. There are several ways to secure beads to your canvas. The first way is to stitch them twice. Yes, twice, not just with doubled thread. 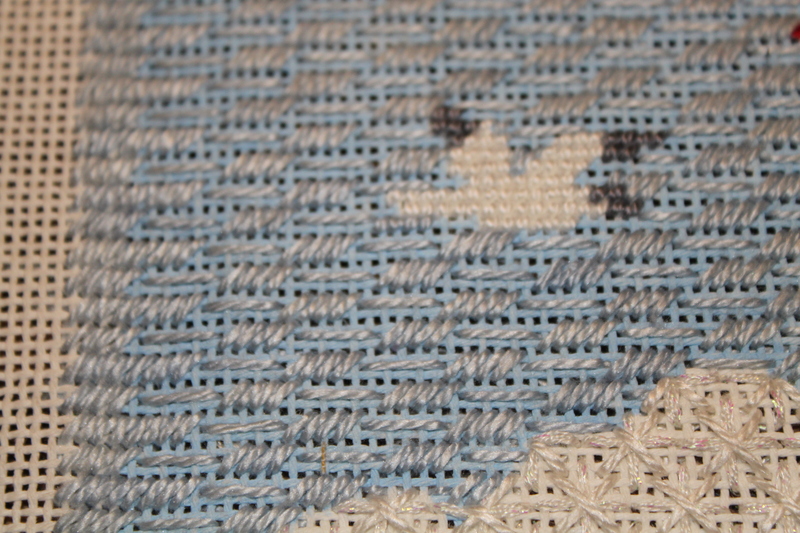 After attaching the bead, go back and repeat your stitch, going through the bead a second time. The second way is called “lassoing.” This technique is done by attaching the bead with your doubled thread (always double your thread). When you have completed your stitch to attach the bead, come up through the canvas again at the same starting hole, split your threads and lay them around the bead and then go down through the canvas again. This creates a lasso stitch around your bead on top of the canvas. Another way of securing beads and also creating a line or curving line, is to tent stitch your beads. After you have a few beads in a row, come back up through the first starting hole, go through a few (3) beads or so and then go back down through the canvas. Repeat this process every 3-5 beads or so. You can get the illusion of curved lines using this technique. 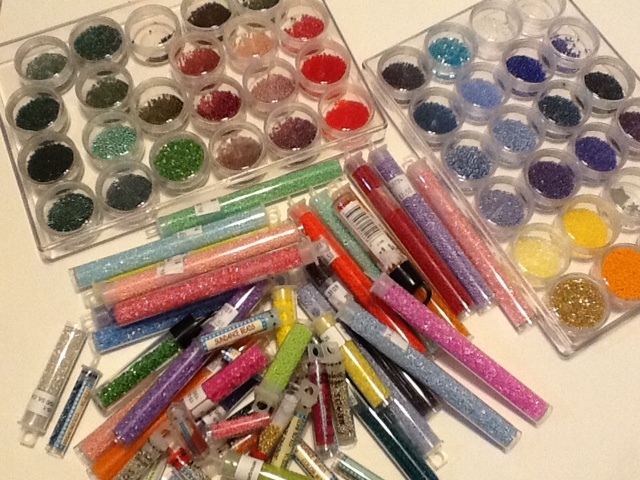 Beads make great embellishments to canvases and can be used on most canvases if secured properly. They can add interest, dimension and depth to a canvas bringing elements to life and adding texture. You can experiment with other stitches and beads, you may find one you like. The idea is to experiment with something new, you don’t learn unless you try something. So grab some beads, a good needle, ample light and in my case a strong pair of reading glasses, and try it for yourself. I am sorry that I have had writer’s block, a busy life and lots of belts to paint lately. I promise that I am going to get much better about giving this blog the attention I should. Ok, now onto the topic of Santa and his beard. 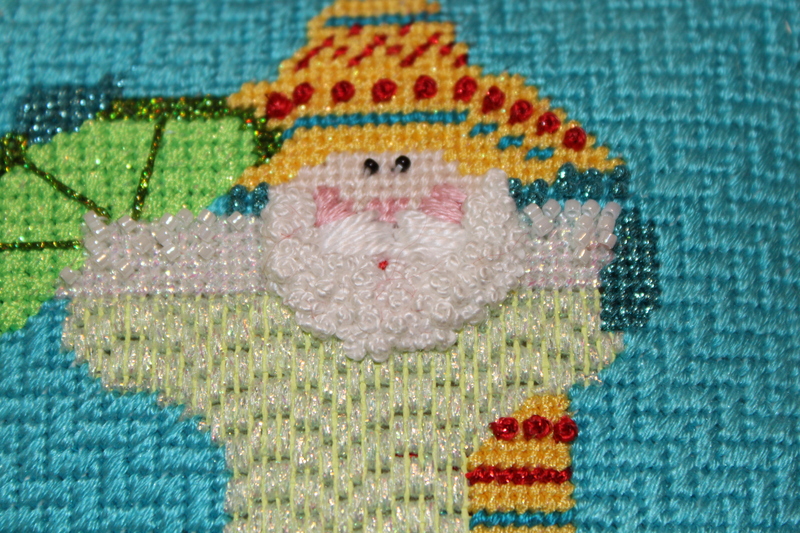 The face of a Santa and his beard are important in any needlepoint piece because they bring life to the Santa. A well painted face is worth every penny! 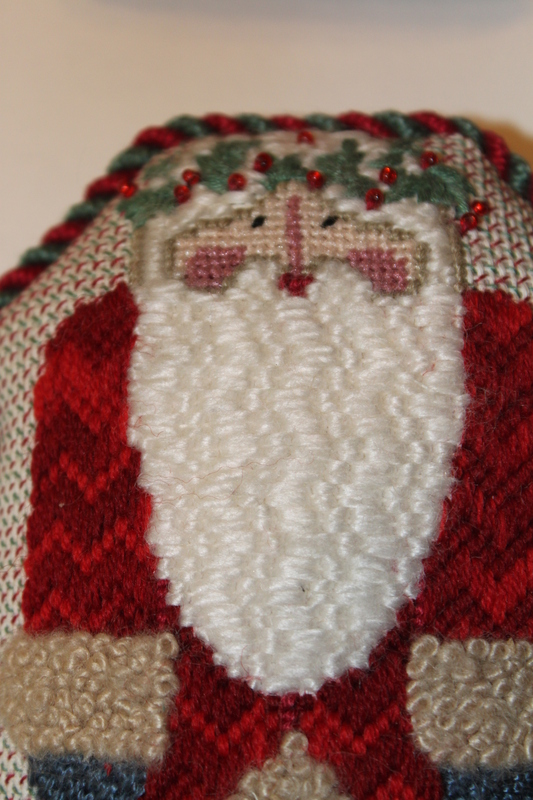 A friend of mine always taught me to stitch the Santa’s face first, because then he is real. The beard on the other hand can wait. I often do the beard last so that the threads don’t get rolled in my scroll and the threads flattened. Everyone is always asking for stitches for a beard, mostly because if you stitch Christmas pieces, chances are you run out of ideas for a beard stitch. The simple long random split stitch in burmilana is always an old stand by of mine. I like the brightness of the white burmilana for a beard. French knots on a stick are easy and quick. I start about 4 or 5 threads from the bottom and bring my thread up, then go down to the bottom of the beard and wrap my needle for a knot and plunge at the bottom of the beard. I continue this process laying in rows of knots, making sure my last row has long stitches at reach from the top of the beard down to that row. French Knots are a great choice as well, especially when done in different fibers. For this piece, there was so much sparkle in the brim of the glass, so I chose Vineyard Silk in bright white. It has just the shine I was looking for but no sparkle. 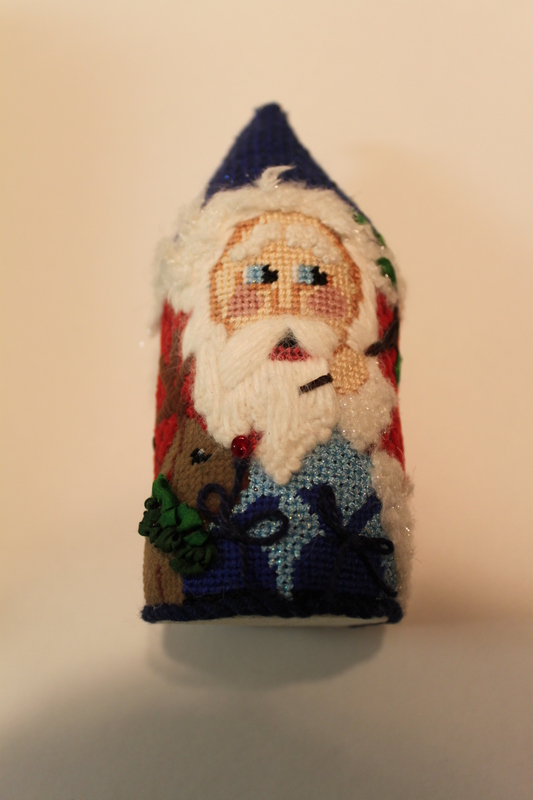 For this Santa, there was such a vertical feel to the coat, so I wanted to do a horizontal stitch for the beard. This is a play on a bargello stitch, unfortunately, the name escapes me at this moment. I like the way it neutralizes the vertical feel of the piece. Whisper is the thread used for this one, just fuzzy enough. Some other stitches to consider would be Double Brick, Double Hungarian, Double Hungarian Ground, Horizontal Parisian, Long Upright Cross and many more. When you are trying to figure out which to choose, look at the canvas from a slight distance and see what the movement of the piece is – diagonal, vertical or horizontal, then choose a stitch that changes the direction from the most prominent feel of the piece. It may not always work, but it will make you think outside of your box for a bit. That’s all for now, until next time…. Some of my favorite books…..
Hi! Every time a new stitch book comes , I love to pour over it and play. I figured I would share some of my thoughts about some of my go-to books when I am planning a canvas. Stitch Landscape from Little Shoppe Canvas Company is a favorite of mine. If you like some of your canvas showing a little, then this is a must have book (or app for your iphone/ipad or itouch). It is a great book with categories for clouds, flowers, grass, mountains, sand, shubbery, skies, snow, soil, stone, trees and water. Each section has lots of great stitches, but don’t limit yourself by just sticking with one category for a stitch, lots of the stitches can work for things other than their designated category. Instead of naming the stitches, they are numbered. This makes it a little more challenging to find them if you are using the app. I have both the app and the book, I like to take more projects in my bag when I go away, so I like stitch apps. I took this book on vacation along with a Kathy Schenkel Lighthouse canvas and decided to play. I am happy with the results, best of all, the whole piece only took a week – don’t have to stitch every hole! 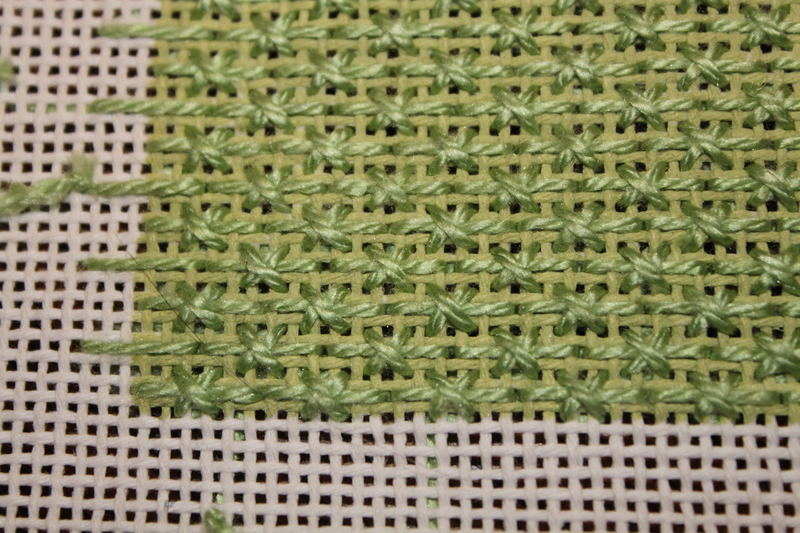 I used Vineyard overdyed silk for the sky, but decided I liked the look of one of the grass stitches (grass #2) for the sky. I have used it many times since in canvases that I have written stitch guides for – it also works if you turn it vertically for a rainy look. The grass is done with Vineyard Silk and grass stitch #34 that is a long stitch with a X over it, quite an effective stitch, lots of texture. The clouds are my favorite I think. Using a combination of Silk Lame Braid and Vineyard Silk gave them just a hint of sparkle. This stitch (cloud #9) would also be great for a large area of snow. Trying to create the illusion of roundness on the lighthouse was a challenge – lots of ripping before settling in and finding a stitch that worked – lazy roman. I hadn’t used that stitch before but found that since I had a large enough area, it works and feels like the lighthouse is rounded. 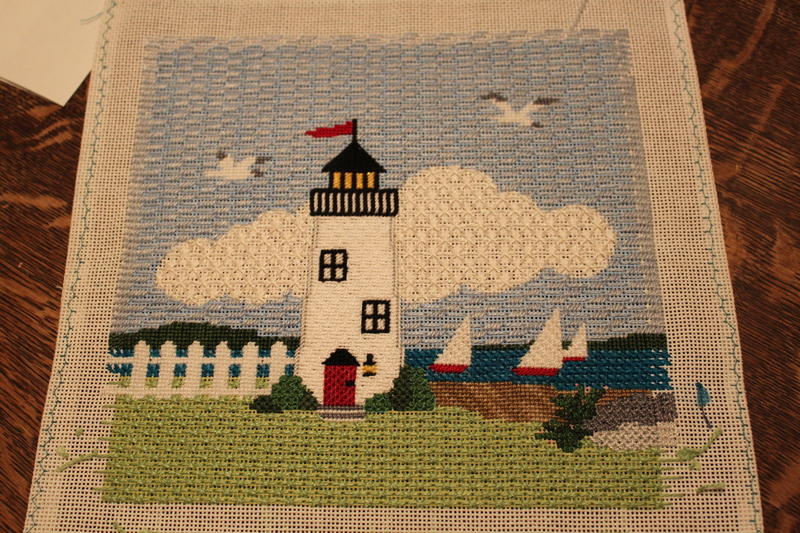 I was sad when my piece was finished, but lucky me – I have a companion lighthouse from Kathy Schenkel to go with it. I am looking forward to playing again with different stitches on the next one. Hello World, it’s Kristine. Just home from the TNNA winter market in Phoenix, AZ. What a trip! Imagine, all your favorite designers plus more you may not be familiar with, all in one place at the same time with all their new canvases on display. So many things to look at! What could be better! The designers had wonderful enticing displays with lots of creatively finished pieces to tempt shop owners. It’s wonderful to see what a canvas can look like “when it grows up” into it’s final form. For some who have great vision, we can see what a canvas can be when it is in it’s flat unstitched and unfinished form, but it is exciting to see new ideas for finishing. It was hard not to want one of everything. The great thing about the world of needlepoint is that there is really something for everyone. There were tradition florals in great contemporary color palettes, interesting geometrics in vibrant colors, Christmas & Halloween every way you could ever want it and Owls. Owls, Owls and more Owls…..funky little owls, big owls with big bold colors, owls on belts, owls on pillows…Owls were definitely a theme with designers this year. Belts are always popular and I was not disappointed! Wide belts are making an appearance in the needlepoint world. These belts are made to be worn without belt loops. Lots of fun patterns in beautiful colors and designs to please all. What would a show be without embellishments. There were dazzling new beads & sequins and a new tubular mesh embellishment. And something new to me, a canvas with blinking lights. The embellishments continue to grow and evolve and offer great ways to bring dimension to your canvas. New tools came to market as well, or at least new to me. A thread separator that leaves those who hate to strand no excuse anymore, ordered that one, even though I don’t mind pulling the strands apart – but maybe this will make it easier. When it arrives, pictures will come. A tool that cuts ribbon and bonds the end, so no more fraying, I might learn to love Frosty Rays again. And last but certainly not least, new threads. We are so very lucky to be stitching at a time, with all the threads choices available. Beautiful silks, overdyes and metallics will all be finding there way to your LNS in the next few weeks and months. Rainbow expanded it’s line of Petite Silk Lame Braid. Threadworx has new colors in Vineyard Overdyed Silk and cotton floss, as well as others (they are just my favorites). And Wiltex has 3 new hot shades of orange that will excite all those Halloween loving stitchers. Bags and leather were plentiful as well. Lee has a great iPad cover as well as a kindle cover. Also from Colonial Needle/Lee is a new rich leather tote, oh so soft, but yet sturdy. I am clearly a bag girl, who doesn’t love a new bag and one with needlepoint! It was great to see the friends I have made and meet some new ones! Thank you Phoenix! 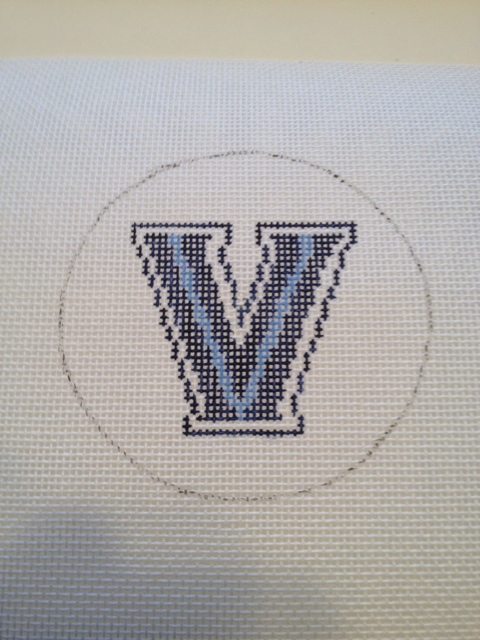 Will try to post pictures tomorrow -have to download…..til next time – Happy Stitching!